With the spring college semester underway, things in our house are even crazier than normal. As a mum, graduate nutrition student, and blogger, I don’t have a lot of spare time on my hands. However, food has such an immense influence on our physical and mental health that healthy eating is not something I am prepared to compromise on. That is why my freezer is bursting at the seams with goodies like these delicious homemade freezer burritos. 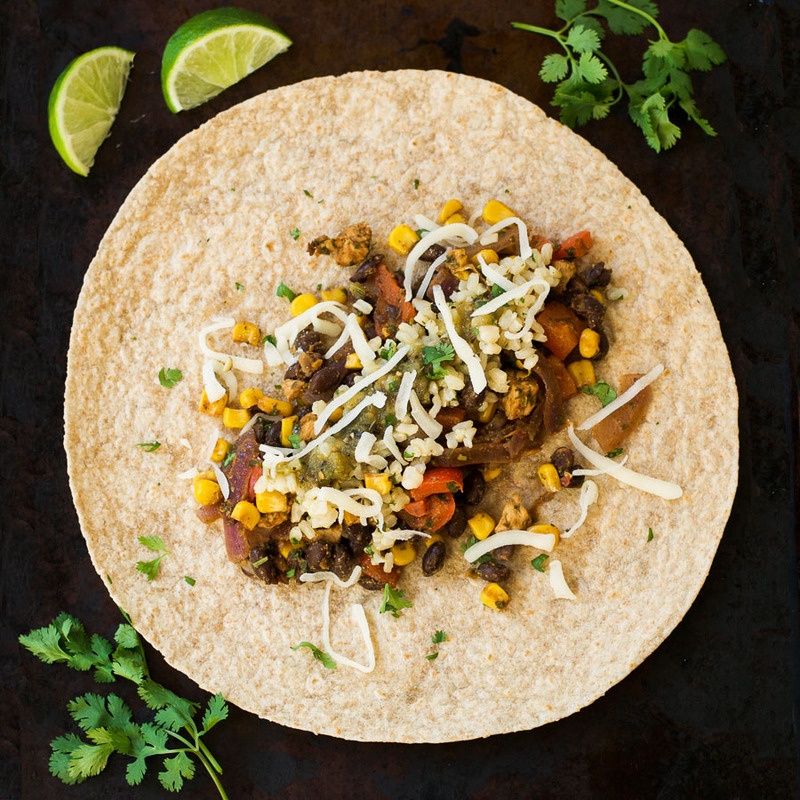 These homemade freezer burritos might seem a little fiddly to make. However, they are an incredibly healthy and delicious way to fill your freezer with meals that can be reheated in the microwave in just 3 minutes. You can take them with you to work for lunch, or grab them for dinner when you get home late. You can dress them up however you like. I usually add salsa, plain yogurt, a sprinkling of cheese, and some brown rice. Whatever you choose to throw in, I can promise that you will be thanking yourself when you come home exhausted and remember these beauties waiting in the freezer. 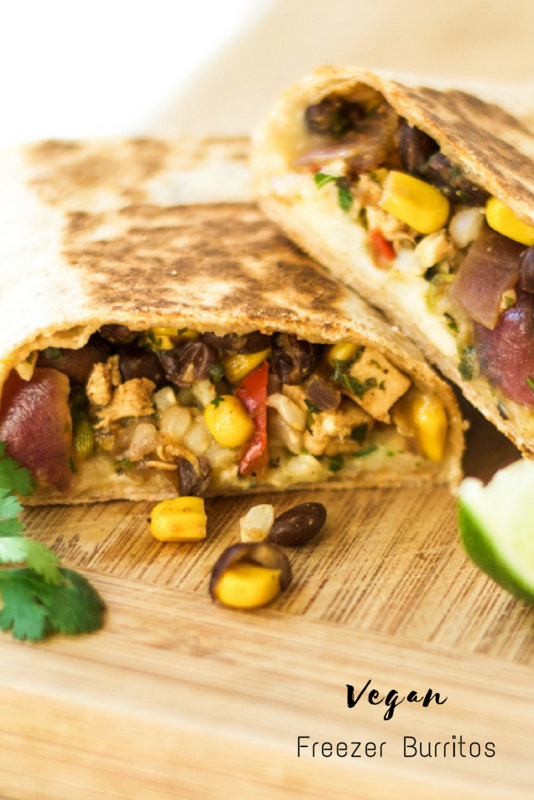 These homemade freezer burritos can be reheated in the microwave in 3 minutes for a healthy and delicious last-minute lunch or dinner. To make the taco seasoning, put the chili powder, cumin, paprika, garlic powder, onion powder, red pepper flakes, oregano, and salt in a mason jar or other container. Shake well and set aside. Add the red onion and cook for about 3 minutes. Add the bell pepper and zucchini, and cook for an additional 3 minutes. Add the black beans, corn, and taco seasoning, cover, and simmer for 10 minutes. Remove from the heat, stir in the cilantro and lime juice, and add salt to taste. To prepare the burritos, place a tortilla on a flat surface. Add ¼ cup of the burrito filling, along with 1 tbsp grated cheese, 1 tbsp salsa, 1 tbsp plain yogurt, and a spoonful of brown rice. Roll the burrito with the ends tucked in so that there are no open ends. Place the burrito in a dry skillet over a medium heat. Cook gently until both sides are lightly browned, around 2 minutes per side. Place on a plate to cool. Once cool, wrap in aluminum foil. 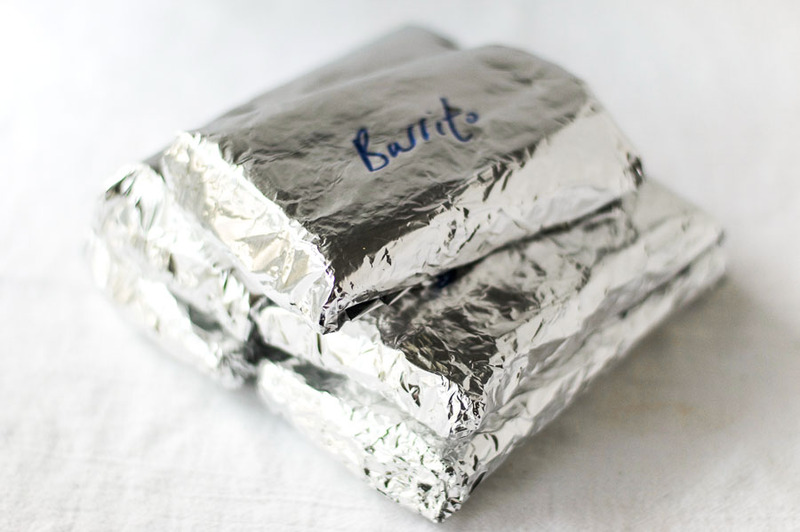 Once all the burritos are assembled, cooked, cooled, and wrapped, place them in a freezer bag and pop them in your freezer. To reheat, remove them from the aluminum foil, wrap them in a piece of damp kitchen paper, and place in the microwave for 90 seconds. Remove from the microwave, cut the burrito in half, and return to the microwave for an additional 90 seconds, or until warm through. 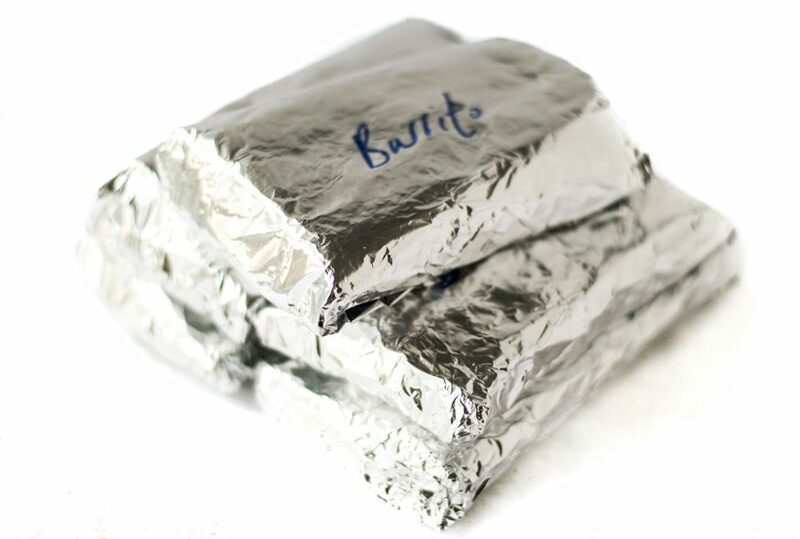 If you do not have a microwave, you can leave your burrito in the fridge to defrost overnight. Once it is defrosted, remove the aluminum foil and place on a dry skillet over a medium heat for about 4 minutes each side, until warm through. « Is Dehydration Slowing You Down? These look amazing! Great idea. I’m always looking for healthy recipes that save time on busy nights. Will be making a freezing some this weekend. Thank you Deborah! I hope you enjoy them. My kids love burritos too. It is such a great way to get extra veggies in them. These burritos freeze really well. It makes for such an easy dinner. This is just what I needed! I’ve been looking for recipes to use tortillas we bought on sale recently, and we finally got a big freezer. Thanks for sharing! Oh good. I’m so glad. I hope you enjoy them Miriam. 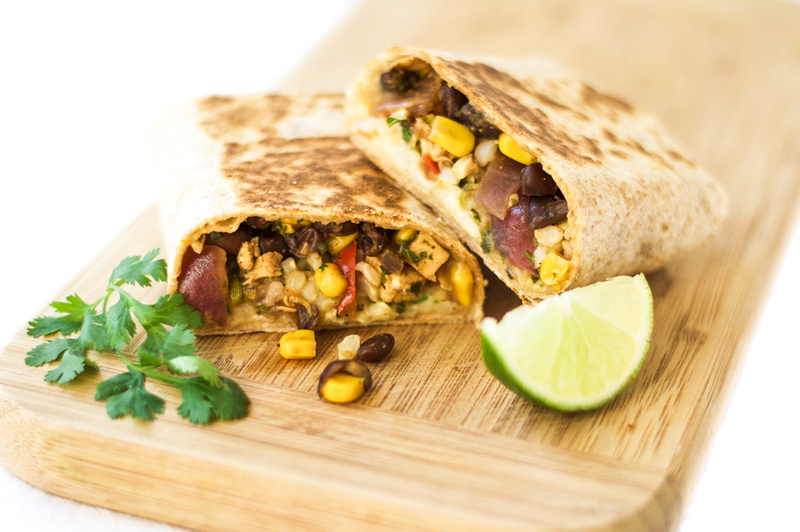 Hi EstherJane, I am a big fan of vegan burritos and wraps so I immediately fell in love with your vegan freezer burritos. I’m pinning, sharing and featuring this post at the Healthy Living Link Party this week @urbannaturale! Wow, thank you so much for your kind words and for featuring me on your awesome link party! Yep – they’re really delicious. I just made 8 of them (used the whole package of tortillas) and now I’m ready for school lunches! Love it. Thanks for a great recipe. Hi Morgan. I’m so glad you liked the recipe. And great idea using them for school lunches! I’ve been searching for healthy lunch options to bring to work. Thank you for this recipe! How long do you think they last frozen? Could you add eggs to make it a breakfast burrito? If vegan, you van substitute cheese for Daiya, and yogurt for Kite Hill almond yogurt. I made these last night. It ended up being 10 instead of 8 burritos for me, but I probably used smaller tortillas. I left out the cheese and yogurt because I’m vegan. I had one fresh and it was amazing(I am not a fan of zucchini so I was apprehensive, but it really made a nice crunch for the burrito and didn’t have the normal taste that I hate because of the seasoning). I’ve been looking for something to replace Amy’s vegan burritos because while they are delicious, $3 a pop when they’re on sale is expensive and just makes me feel bad for buying. Tonight I had one for dinner and I will say it lost a lot of the outer crunch in the microwave, but it was still delicious, I didn’t even have any left on my plate to give to the dog to lick off. I think tomorrow, since I didn’t make this recipe for the quickness, but rather for saving money and not having to cook a full dinner for everyone on nights that I work, I’m going to defrost it overnight and throw it on my grill press to see if that will keep the crunch. I’m so happy I found something that tastes as good as Amy’s burritos. These are definitely going to become a monthly staple, though I think I might experiment with using mango or pineapple salsas for variety. Thank you so much!